Samsung Display showcased their technology with world’s first 55inch transparent OLED and mirror OLED display. 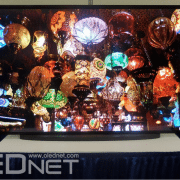 In Retail Asia Expo 2015 (9 – 11 June) held in Hong Kong Convention & Exhibition Centre, Samsung Display presented transparent and mirror type OLED in 55inch large size. Retail Asia Expo is Asia’s largest exhibition that showcases retail solutions from international exhibitors. It is the first time that transparent and mirror OLED panels have been presented in this size. This exhibition is significant in that Samsung Display is demonstrating their leadership in innovative display technology. 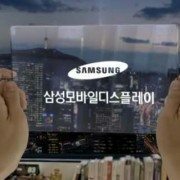 Samsung Display’s transparent OLED showed 45% transmittance, FHD resolution, and 100% NTSC, improved specifications compared to existing commercialized/revealed transparent LCD in terms of transmittance and color gamut. Samsung Display announced that this transparent OLED is able to show clear screen closer to normal glass. In mirror display, higher the reflectance level, lower the sense of anomaly with cloudiness. Mirror OLED showed 75% of reflectance level, which is at least 50% higher reflectance than competitive mirror LCD. This product has minimum 100,000:1 contrast range with response time of under 1ms, compared to LCD’s 4,000:1 and 8ms respectively, and can be used in various applications. Samsung Display also presented transparent and mirror OLED applications. For transparent OLED, Automobile Real Sense Solution was showcased. 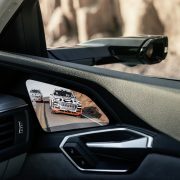 The display is placed next to cars to provide information, as well as show what the car would look like with or without certain optional extras. Similarly, display called Magic Mirror showed application for mirror OLED. A display that can be used in jewelry stores, consumers can see reflections of themselves wearing the necklace or earrings without having to wear them. It is expected that this technology will be used in fashion and beauty industries. Samsung revealed that using Intel’s RealSense solution, face, motion, and background recognition technology, highly realistic AR (augmented reality) can be actualized. “Samsung has a long legacy of leadership in technology innovation for digital signage, as well as for other applications, and we are now leading the next wave of digital signage advancement with our Mirror and Transparent OLED display solutions,” said Oseung Yang, vice president, Samsung Display Company. “We are very excited to help bring a new interactive dimension to the world of multi-channel shopping through the integration of our newest OLED displays with Intel’s RealSense technology,” he added. Samsung Display, to break through crisis with diversification of OLED customer! Foxconn Takes Over Sharp…what will happen to Samsung·LG?